We spent a lovely sunshiny day in Tacoma. First, a picnic lunch overlooking the Narrows Bridge. Then on to the Camp 6 Logging Museum in Point Defiance Park. 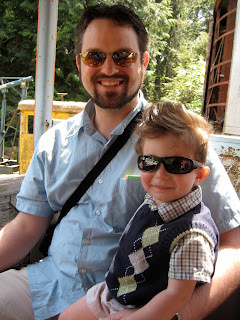 Matthew enjoyed the train ride through the wilderness. Next, we strolled around the park in the wagon watching the ducks in the pond with their ducklings and the turtles sunbathing. Then we found a nice spot to blow some bubbles. Here are my fellas - the man who gave me a child and the boy who made me a mommy. Ahhhhhh. True love.